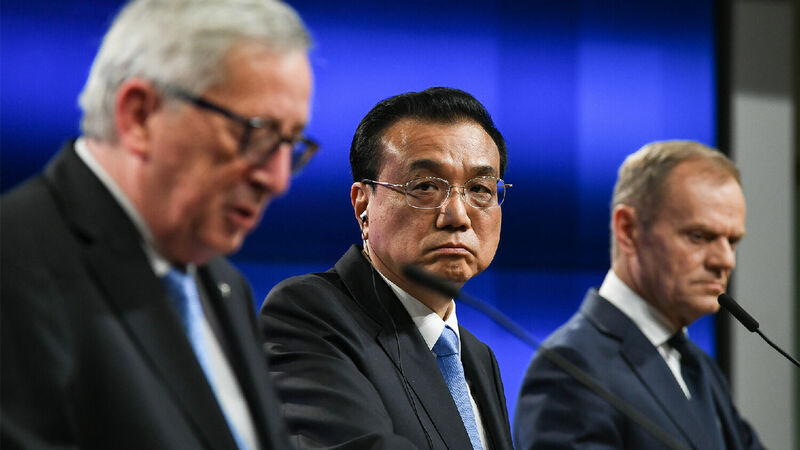 (From left) President of the European Commission Jean Claude Juncker, Chinese Prime Minister Li Keqiang and President of the European Council Donald Tusk take part in a press conference at the EU-China Summit in the European Council in Brussels, Belgium, on April 9. European Council President Donald Tusk called negotiations between China and the European Union a “breakthrough.” Even days before the meeting, Western media outlets were skeptical and doubted the outcome. But despite the skepticism, China and the EU issued a joint statement on April 9. The two partners reached a consensus on common concerns on the strategic level and issues concerning bilateral trade and investments. If the result of a global shift of interests between the two sides is already surprising, a second aspect seems to be a downright radical change. Such an agreement would be virtually ruled out today between the traditional partners of the U.S.A. and Europe …. Despite various disagreements between the two, the EU now appears keener to cooperate with China than with the United States. Even more shocking is that the EU and China are uniting against the U.S.
For decades during the Cold War, the West was united in fighting a Communist alliance. Germany and the U.S. jointly defended the values that united them and pushed back against Communist influence in Europe. After the collapse of the Soviet Union and the formation of the European Union, it seemed as if the German-American alliance stood for the hope of the future. No one at the time would have thought that Germany would join the camp against America. But with the rise of U.S. President Donald Trump, suddenly everything has changed. The world order that was believed to bring security crumbled. The U.S., the beacon of light, suddenly attracted the hatred of the world. What used to be taken for granted suddenly vanished. And despite their many differences, the EU and China are uniting as a bulwark against the U.S. Of course, these trends started years earlier, but they only became apparent with the inauguration of President Trump. With a German-led Europe (the king of the north) possessing great maritime power, North America will be surrounded on the east by Europe and the south by Latin America. The Bible contains many prophecies of that European power attacking America—and many other prophecies of America being besieged. Mr. Flurry made this prediction many years prior to the election of President Trump. At the time, China and Europe were still separated by a great gulf of disagreements, and the EU still sought a trade agreement with the U.S. Read “The Great Mart” in the August 2012 Trumpet issue to learn how Mr. Flurry was able to make this forecast. At the time that Mr. Armstrong wrote that, Europe was bitterly divided and about to experience World War ii. The same was true for Russia, China and Japan. China, at the time, wasn’t a global power and was threatened by Japan. Since the history of the last 200 years has been predominantly shaped by the United States and Great Britain, this prediction seemed unlikely to come to fruition. But today, Europe is united. Russia and China are bonding and even drawing Japan into their camp. Just as Mr. Armstrong prophesied, these two power blocs are starting to dominate the world. Chittim (verse 1; biblical Kittim—Genesis 10:4) gave birth to the land of Chaldee, or southern China. China and Japan were prophesied to be powerful nations in this end time (see “Who Is Chittim?”). They are trading mightily with the Holy Roman Empire and suffer greatly when it collapses. So the prophecy in Isaiah is about two trade blocs—one led by Germany, the other by China—coming together in a brief alliance. But America (descended from biblical Israel) is excluded from the alliance. Over the last few decades, the U.S. has traded heavily with Europe and China. A break from this status quo had seemed unlikely—but no longer. Bible prophecy has again proved to be more reliable than news analysts could ever be. Many biblical prophecies have already been fulfilled, even though most people do not realize it. Read more about these prophecies by requesting free copies of our booklets He Was Right and The Proof of the Bible. To learn more about these prophecies and the wonderful outcome that will follow today’s dark news, request a free copy of Isaiah’s End-Time Vision, by Gerald Flurry.